A TENS machine is a small handheld battery powered device with four little pads you you get someone (usually your birth partner or Doula) to stick onto the skin on your lower back. There’s a guide in the picture here, but follow the instructions with your TENS machine. There are electrodes in the pads, and wires go from each of these four into a small handheld control until - you can hold it, hand around your neck or clip onto your clothes. When you press a button on the device, tiny electrical pulses (that feel like tingling sensations) are then delivered into the electrodes in the pads. In a nutshell this both stimulates endorphins (the bodies own all-natural super-strong pain killers) and reduces the number of pain signals sent to brain by the spinal cord - so you feel less pain. More details of HOW this works below. You can increase the power of these impulses using your control unit as your labour progresses. During a surge (contraction), you can press a ‘boost’ button to deliver a stronger pulse (which many women LOVE!). How does a TENS machine work in labour? How TENS works - in more detail, the science stuff… When you press the button on the control unit, the pads with the electrodes on your lower back receive a small electric current - which you feel as the tingling on your skin. This electric charge stimulates nerve fires which carry touch sensations quickly to the brain (see the blue line in diagram). These sensory messages are deemed high priority by your brain and limit other ‘information’ getting through. 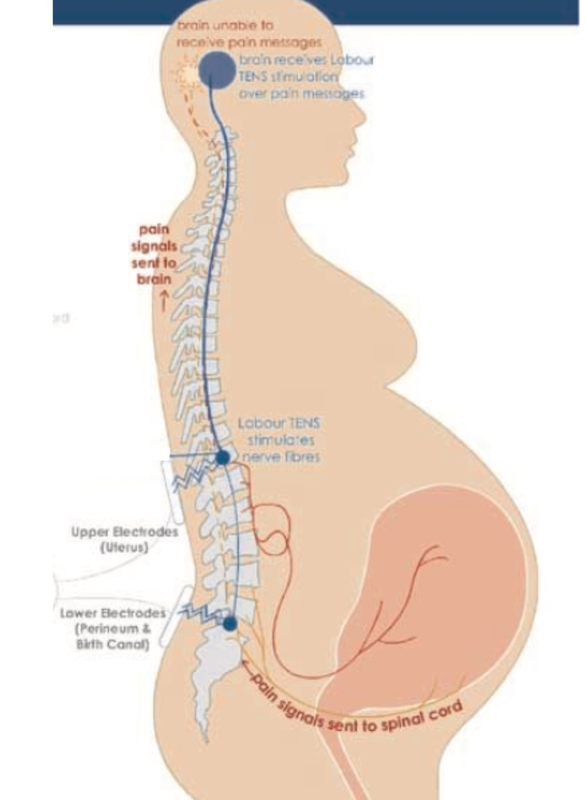 The slower pain messages (sensations of the surges in labour) are carried by smaller nerves (the orange and red lines in the diagram) are stopped by a neurone inhibitor. So the sensations of ‘pain’ the brain receives are reduced (its called ‘gate theory’). Pretty clever, but also very simple too. In addition to this the TENS machine stimulates the body to release more of its natural pain killers called endorphins (because the pads act on the skin, causing a ‘tingling’ sensation). So as well as blocking the pain, they also boost your bodys own brilliant natural painkillers (which are super strong, but super natural and totally safe of course - because your body is making them). I also show you an *amazing* massage technique for labour that releases oodles of endorphins too on my Hypnobirthing & Birth Preparation courses. You can not have too many endorphins in labour - every little helps! YOU control it yourself, and decide when you press the button, and how strong (turn it up to 11 if you like!). Pressing the button and being distracted by the sensations it gives you can be hugely helpful in itself. Other pain relief options can still be used with a TENS machine, both pharmacological (drugs) or complimentary methods. 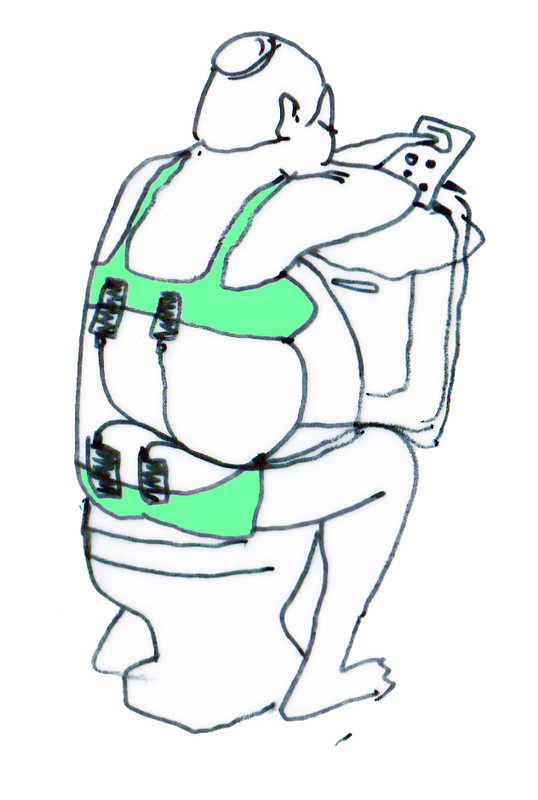 You can use in anywhere - at home, birth centre or hospital. And because you have your own, no-one else can be using it and so is ‘unavailable’. It can be a bit ‘marmite’ - you might love your TENS machine, or hate it. But if you are a hater then you can simply remove the pads at at time. Some women don’t like being wired up to a gadget. You can’t use in water! So you might have to keep taking off the pad, and putting on new ones if you are getting in and out of the bath/shower/birth pool. Some people don’t like the faff, some think it worth it. Now this is important, you need to be prepared!! You’ll need to buy, borrow or hire your own to use wherever you give birth. This is pretty much the only downside (they are not available on the NHS for free). They are around £50 to buy, or £25 to hire (and you can do it through the post, so available all around the country). You need to make sure you get a special one for labour, rather than one for back pain (they are stronger!). Borrow TENS machine from me for FREE! As I know this cost can be a barrier to women using TENS, I’m really delighted to day that I have purchased a couple of TENS machine for use by folks on my Hypnobirthing & Birth Preparation courses and Pregnancy Yoga classes in York - for FREE. All you’ll have to do is purchased some new pads (that’s only around £5). I really hope it can make this more accessible, and you can save money to spend on other things - babies and pregnancy can be expensive! I hope that’s been really useful. I know so many women from my classes and courses have really benefited hugely from using TEN in their labours. If you want to know more about ALL of the comfort measures for labour, including so many brilliant techniques that my Hypnobirthing Courses will show you then do get in touch. If you’ve used TENS before then comment and let me know how you found it. You can find all the details of my Hypnobirthing & Birth Preparation Courses in York here online. Oh and if you don’t know how and why a TOILET can be brilliant in labour - then you need to come along to a course (SO many benefits)! !